The times, when Turkey was considered an insiders’ tip for Yacht Charter are definitely gone. In particular the Southwest of the country is ranked very high in the community of Yacht Charter Turkey sailing, the choice of charter yachts in Turkey is outstanding and the price level for Yacht Charter in Turkey still moderate. The contrast between orient and occident remains fascinating and the Turkish coast offers many delicacies for Yacht Charter Turkey crews. The maritime infrastructure for yacht charters Turkey has been considerably improved in the last years: Countless modern marinas are at the guests’ disposal.Turkey Yacht Charter crews can still find solitary, dreamlike bays that you share with only a few other yachts and goats, as well as secluded bays with restaurants. In many cases, the hospitable restaurant owners have installed buoys for mooring or jetties for their Yacht Charter Turkey costumers, which are often enough equipped with electricity and water. Mooring is usually free of charge for Yacht Charter Turkey crews. Mostly it is appreciated but not mandatory to consume something on shore. The Turkish Yacht Charter waters are also an ideal cruising area for less experienced charter skippers, families and people, who want to sail with great relish. On the one hand, you’ll always discover exiting cruise destinations even on the short distances, on the other Yacht Charter Turkey crews will hardly come across strong winds in the summer months. Also Yacht Charter Turkey crews intending to do land excursions will discover lots: hot springs, water falls or rock tombs, accessible via river cruise. The rock tombs in Myra, and other highlights of the antiquity like Ephesus, Xanthos or Kaunos are situated close to the coast and at easy distance for hiking. 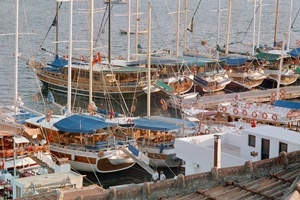 The most popular Yacht Charter bases are Bodrum, nearby the Palmarina (Port Bodrum Marina) in Yalikavak on the Bodrum Peninsula, the center of yacht charter Turkey tourism Marmaris and Orhaniye near Marmaris, Port Göcek and Fethiye both in the Gulf of Fethiye, and on the western coast in Cesme / Marina Alacati and in Teos Marina in Sigacik near Izmir. The Yacht Charter Turkey area stretches from Cesme on the West coast to Antalya on the Turkish Riviera. 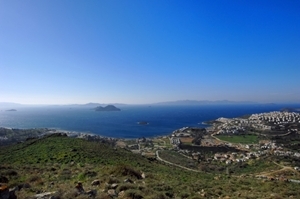 Most sailors however cruise in the area of Bodrum in the Gulf of Gökova, near Marmaris and in the Gulf of Fethye. Also the short transfer to the Greek islands of Kos, Rhodes or Symi has been made easier for Yacht Charter Turkey crews by local authorities. 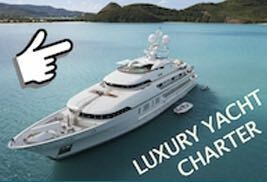 If you want to cruise along the Turkish coasts with a luxury yacht with crew we offer Yacht Charter of crewed motor yachts, sailing yachts, motorsailors and very luxury traditional Turkish Gulets – please have a look at Yacht charters Luxury Crewed Yachts in Turkey and ask for offers.